ERGO Network brought together its co-workers from Romania, Hungary, Czech Republic and Bulgaria for the 3rd working meeting under the Annual Working Program (AWP) 2016 on the 20-21 September in Brussels. The aim of the meeting was to exchange good practices and challenges that the members are encountering in the work done under the AWP 2016. On the first day, special attention was given to the work that is carried under the contract with ERGO for the Community-Led Local Development (CLLD). The ERGO team facilitated the meeting and helped the members to map out the challenges and together with their partners to find solutions for a better collaboration and implementation of the CLLD on the ground. Furthermore, special emphasis was given to the Roma coalition building and the ways that those coalitions are being created at the national and regional level. For example in the Czech Republic, the Roma coalition strengthened its position and became a partner for the Roma Coordination Unit. 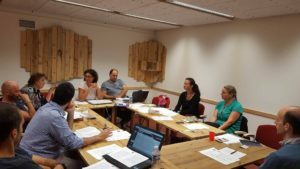 In Romania, the coalition taken over by our partner Nevo Parudimos, Roma Forum, is already in good terms with the National Federation of the Local Action Groups and advocates for the participation of Roma people in Local Action Groups (LAGs). The most challenging issues concerning the development and participation of Roma people in the CLLD process through the LAGs, identified by our members in all countries, are lack of trust in the NGOS and institutions in charge and the political environment. On the second day, special focus was put on the methodology and guidance on how our members should carry out their research on Roma beneficiaries of ESF supported projects and prepare their policy papers for the remaining year. The objective of the research is to capture the views of beneficiaries of (training) projects – which is mostly missing from regular project and program evaluations. The research is to provide an indication of the longer term impact of such projects on the individuals taking part as well as give an idea of the quality of the projects. In addition, the ERGO members were updated with the ongoing work of ERGO at European level and together we planned further steps for the future.